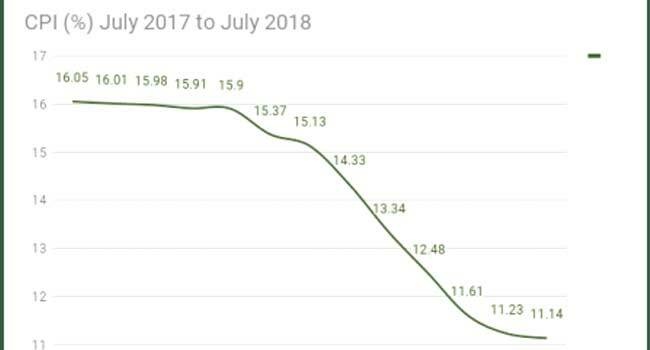 Nigeria’s inflation fell from 11.23 to 11.14% for the month of July, statistics released by the National Bureau of Statistics (NBS) on Wednesday showed. According to the NBS, the consumer price index fell by 0.09 per cent to 11.14 per cent last month, from 11.23 per cent recorded in June 2018, making it 18 straight decline years on year. In July 2018, food inflation on a year-on-year basis was highest in Abuja (15.85%), Bayelsa (15.75%) and Imo (15.46%), while Plateau (9.40%), Bauchi (10.44%) and Kano (10.50%) recorded the slowest rise in food inflation. On a month-on-month basis, July food inflation was highest in Kwara (4.57%), Kaduna (3.99%) and Imo (3.44%), while Ogun (0.16%) and Osun (0.38%)recorded the slowest rise. Kogi recorded food price deflation or negative inflation (general decrease in the general price level of goods and services or a negative inflation rate) in July 2018. Similarly, the country’s urban inflation eased to 11.66 per cent in July 2018 from 11.68 per cent recorded in June while the rural inflation rate remained flat at 10.83 per cent in July 2018 from 10.83 per cent in June 2018.